Best Alternative to Athletic Greens? There are probably a dozen more brands available through independent sellers, but I refuse to knowingly give credence to products sold by multi-level marketing con artists companies. First, I created a spreadsheet with every ingredient listed on the Athletic Greens label. Then I compared these ingredients to the labels of competing products. In the second part of my assessment, I drank one per day as my breakfast. I prepared every brand the same way: 12-14 ounces of cold spring water, blended with 3 scoops of raw unflavored goat protein. After trying each of the options, I whittled them down. 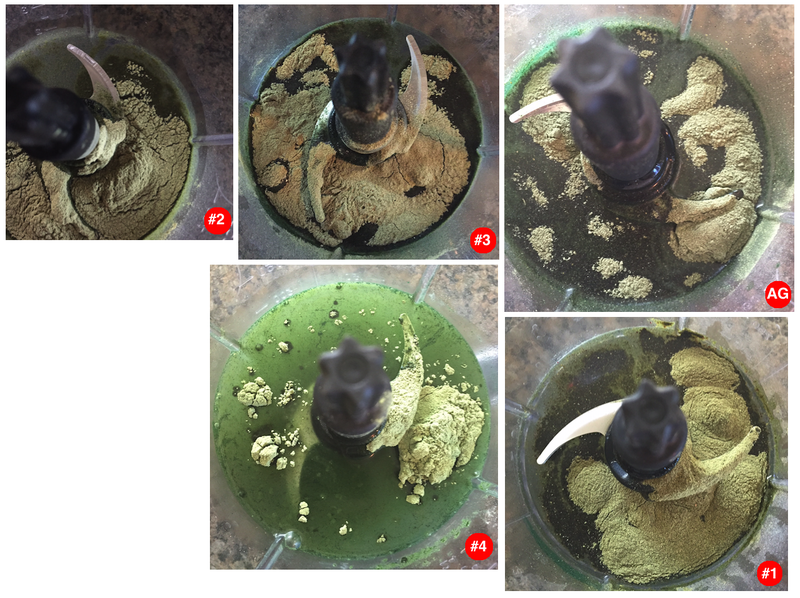 Below, I’ve displayed photos of the top-3 powders (click to zoom), plus a shot of the Athletic Greens (labeled “AG”), as well as a fourth product that I deemed “last” on the chart for comparison purposes. I opted to include the weakest alternative to show you the considerable difference in appearance. While I like the fact that it comes in convenient travel-friendly packets, and that their customer service department was outstanding (best overall), the product itself quite literally pales in comparison to the other greens powders due to having so few ingredients (only 12). When you compare it to Athletic Greens, which is an extremely dark/dense green color, Lean Green is a bust. Price wise, I can’t justify recommending a $40/month product that falls so short on nutrients. To be clear, there’s nothing “wrong” with the product itself, it just doesn’t really belong in the same category. If we compare the appearance of Super Greens powder in water to that of Athletic Greens, it’s quite similar. The taste and smell is nearly indistinguishable as well. In fact, I probably wouldn’t be able to tell which is which in a blind taste test. So why is Super Greens ranked third? For starters, it only shares 27 ingredients with Athletic Greens (truth be told, the similarity in appearance makes me wonder if AG really has an additional 48 items). The problem I have with Super Greens is it contains milk. For those who are sensitive to dairy, this would be problematic. Among all the greens powders I tasted, PhytoFood actually tastes the best. I was legitimately disappointed after the container was empty. Unfortunately, this isn’t a taste comparison – it’s about comparability to Athletic Greens (which doesn’t taste very good, FYI). 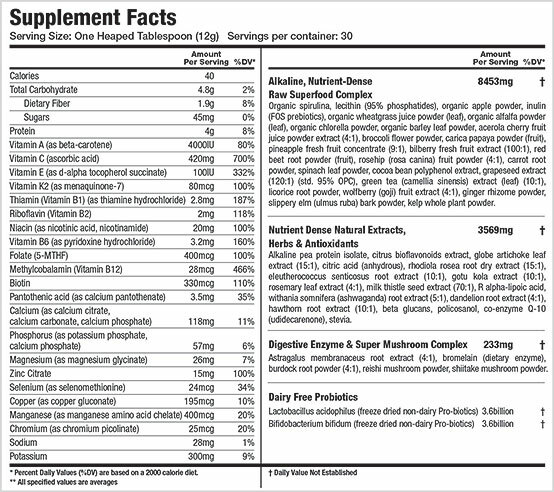 Nevertheless, PhytoFood has 26 of the same ingredients as AG, plus a whopping 28 more of its own. I felt a similar “energy buzz” shortly after drinking this as I do from Athletic Greens… So if you’re big on taste, I’d go with PhytoFood. Even as a stand-alone drink in cold water, it tasted pretty good. A company called Vibrant Health makes a host of different greens powders. I’m going to recommend two of them, as they’re both outstanding substitutes for the pricey Athletic Greens, and the “winner” of this comparison. Taste wise, it’s what you’d expect from a dense vegetable powder, but it’s really no different than Athletic Greens in terms of aroma/flavor. For some strange reason, Athletic Greens costs much less ($77.00 plus tax) if you buy it directly from them using their recurring auto-ship program. When I contacted the company about this gaping price discrepancy, the customer service rep agreed that is was peculiar, but offered no explanation. My guess is that their marketing department wants an opportunity to continuously up-sell you on their other nutritional supplements (not cool, btw). So if you don’t mind getting bombarded with sales emails, this may be the preferred option for you. If AG ever decides to re-think their Amazon pricing strategy, I’d buy it through there month after month. Until then, however, my money will be going towards Green/Maximum Vibrance. Green vibrance and maximum vibrance are about the same price, but the former has 60 servings and the latter has 15. Max has protein and is a meal replacement type of drink, so they are not apples to apples comparison.